NY Portuguese Short Film Festival, the first Portuguese short film festival in the United States is coming back to Romania in December! Every year this festival brings you the best of Portuguese cinematography, while promoting young Portuguese directing voices all around the globe. 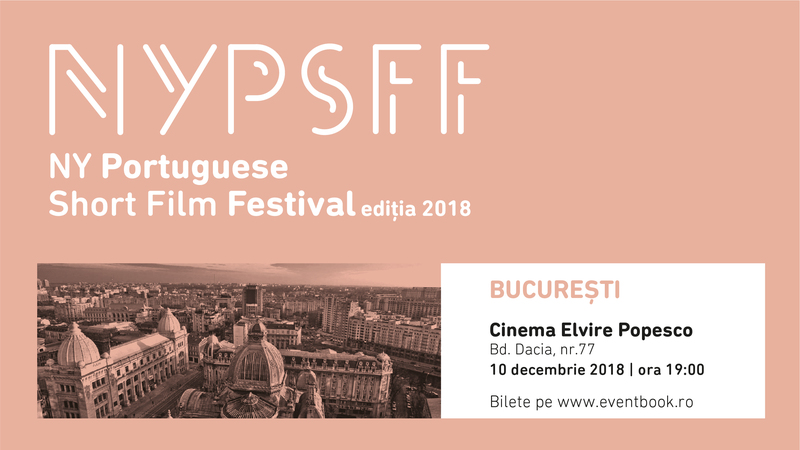 Screenings are scheduled to take place in Cluj-Napoca and in Timișoara on 4 December and in Bucharest on 10 december. The 13 short movies which make up this year’s edition place their bets on identity, in all its shapes and sizes. “Vhils – Debris, Macau”, the short film written and directed by José Pando Lucas in collaboration with Vhils – the epic visual artist, who (by the way) visited Romania back in 2016, questions the human condition in today’s society. “Grind” by the award-winning Yuri Alves tells the Story of Robert Wilmote, a Liberian refugee who builds a new life in the United States, who finds the inner strength to overcome terrible obstacles and to become a role model for his community. “The Hat”, directed by Alexandra Alves, is a though-provoking animation, a story of how a street cleaner’s day changes completely after he finds a magic hat. • Timișoara, 4 December, 18:30, Aula Bibliotecii Centrale Universitare „Eugen Todoran”. Subtitles available in Romanian and English. The translation of subtitles into Romanian was made possible with the help of the Fernando Pessoa Department at hte Faculty of Foreign Languages, Bucharest University, Corina Nuțu and Claudia Vlad, as part of the Subtitling workshop for students, initiated by translator Simina Popa. Partners: Institutul Francez din România, Camões – Instituto da Língua e da Cooperação, Ambasada Portugaliei la București, Catedra Fernando Pessoa, Centrul de Limbă Portugheză Camões din București, Cluj-Napoca și Timișoara, Cinema Victoria, Universitatea de Vest, Biblioteca Centrală Universitară „Eugen Todoran” din Timișoara. Media partners: Librăriile Humanitas, Radio România Cultural, Revista Zeppelin, The Institute, Raftul cu Filme, The Romania Journal.